Only half of the states are home to a National Park. While every state has its share of National Monuments, National Historic Sites, National Battlefields and other sites managed by the National Park Service, these parks are the jewels in the crown. Denali National Park and Preserve: Home to the highest mountain in North America. Gates of the Arctic National Park and Preserve: This park lies above the Arctic Circle, alongside the Brooks Range, and has six wild and scenic rivers. Glacier Bay National Park and Preserve: Watch glaciers calve and whales play. Katmai National Park and Preserve: It has 15 volcanoes and a large population of brown bears. Kenai Fjords National Park: Stunning glacier-carved landscapes and abundant wildlife. Kobuk Valley National Park: On of the largest yet least-visited National Parks. Lake Clark National Park and Preserve: Forest, tundra, lakes, glaciers, and volcanoes. Wrangell - St. Elias National Park and Preserve: Bounded by two mountain ranges with almost 10 million acres of wilderness. Grand Canyon National Park: Focusing on the Grand Canyon of the Colorado River, park illustrates one of the most spectacular examples of erosion anywhere in the world. Petrified Forest National Park: Features one of the world's largest concentrations of petrified wood, Indian ruins and petroglyphs, and portions of the colorful Painted Desert. Saguaro National Park:​ ​​Features the giant saguaro cactus, which may reach a height of 50 feet and is unique to the Sonoran Desert. Hot Springs National Park:​ Features 47 thermal springs flowing from the southwestern slope of Hot Springs Mountain. Channel Islands National Park: Comprising five islands off the Southern California coast, the park includes nesting seabirds, sea lion rookeries, and a variety of plants found nowhere else in the world. Death Valley National Park: This large desert, nearly surrounded by high mountains, includes the lowest point in the Western Hemisphere. Joshua Tree National Park: Desert park and Biosphere Reserve features a variety of plants and animals and a representative stand of Joshua Trees. Kings Canyon National Park: The third oldest national park features a rugged canyon and powerful river, waterfalls, and desolate backcountry. It includes Grants Grove and Cedar Grove. Lassen Volcanic National Park: Established as a national park due to active volcanism. Lassen Peak erupted intermittently from 1914 until 1921. Redwood National and State Parks: Features old growth coastal redwood forests and 40 miles of scenic Pacific coastline. Sequoia and Kings Canyon National Parks: The second oldest national park is home to groves of giant sequoias, Mineral King Valley, and Mount Whitney. Yosemite National Park: Established in 1890, this Sierra Nevada park features alpine wilderness, groves of Giant Sequoias, and the glacially carved Yosemite Valley. Black Canyon of the Gunnison National Park:​ No other canyon in North America combines the narrow opening, sheer walls, and startling depths visible here. Mesa Verde National Park:​ The first cultural park set aside by NPS features the best preserved and most notable pre-Columbian cliff dwellings and other works of early Americans. Rocky Mountain National Park:​ Designated a Biosphere Reserve, park straddles the Continental Divide and features 14,000-foot peaks. Biscayne National Park:​ ​Protects interrelated marine ecosystems including mangrove shoreline, bay community, subtropical keys, and the northernmost coral reef in the U.S.
Dry Tortugas National Park:​ ​Park's cluster of seven islands includes Fort Jefferson, the largest all-masonry fortification in the Western Hemisphere, a bird refuge, and abundant marine life. Everglades National Park:​ ​The largest subtropical wilderness in the continental U.S. includes extensive fresh- and saltwater areas, Everglades prairies, and mangrove forests. Haleakala National Park: Situated on the Island of Maui, this uniquely beautiful park preserves volcanic landscape, ecosystems of Kipahulu Valley, the scenic pools along Oheo Gulch, and many rare and endangered species. Hawaii Volcanoes National Park: More than 4,000 feet high (and still growing) the volcano of Kilauea adjoins the much larger and older Mauna Loa, a massive volcano towering 13,679 feet above sea level. Yellowstone National Park:​ Mixing geothermal activity with the natural world of the Wild West, America's first National Park exemplifies iconic Americana. Mammoth Cave National Park:​ As the world's longest cave system, this park has much to offer its visitors. Tours are actually hikes inside the Earth showcasing eroding limestone located 200 to 300 feet below the surface. Acadia National Park: It may be one of the smaller national parks, but Acadia is by far one of the most scenic and picturesque parks in the U.S. Whether you come in the fall to enjoy the stunning foliage or visit in the summer to swim in the Atlantic Ocean, Maine is a beautiful area to tour. Roosevelt Campobello International Park: Park is a joint memorial by Canada and the United States and a symbol of the close relationship between the two countries. Here are the cottage and the grounds where President Franklin D. Roosevelt vacationed and where he was stricken by poliomyelitis at the age of 39. Isle Royale National Park:​ Rising out of the vast Lake Superior is an island that is isolated like no other national park. Instead of visiting for a few hours like some parks, visitors typically stay for three to four days at Isle Royale. Voyageurs National Park: One-third of Voyageurs National Park is water, mostly in four main lakes which are all linked by waterways. Scattered throughout are forest areas which from the sky almost look like a giant jigsaw puzzle. Glacier National Park:​ ​With over 700 miles of trails, Glacier is a hiker's paradise for adventurous visitors seeking wilderness and solitude. Relive the days of old through historic chalets, lodges, transportation, and stories of Native Americans. Yellowstone National Park:​ ​Mixing geothermal activity with the natural world of the Wild West, America's first National Park exemplifies iconic Americana. Death Valley National Park:​ ​This large desert, nearly surrounded by high mountains, contains the lowest point in the Western Hemisphere. Great Basin National Park:​ This 77,180-acre Nevada park draws only about 80,000 visitors a year, making it one of the least visited of the US national parks. Great Smoky Mountains National Park: Great Smoky Mountains is that it is the nation's busiest park with more than nine million visitors every year. It covers 800 square miles of mountainous land and preserves some of the world's most stunning deciduous forests. Theodore Roosevelt National Park:​ Situated in the North Dakota badlands, Theodore Roosevelt National Park is home to a variety of plants and animals, including prairie dogs, bison, and elk. Cuyahoga Valley National Park:​ Unlike vast wilderness parks, this national park is full of quiet and isolated trails, tree-covered hills, and serene marshes thriving with beavers and herons. Crater Lake National Park:​ It is hard for visitors to forget their first view of Crater Lake. With stunning cliffs towering over 2,000 feet above, the lake is tranquil, stunning, and a must-see for all who find beauty in the outdoors. Congaree National Park: Established in 2003, this lush land in Central South Carolina is the largest contiguous tract of old-growth bottomland hardwoods in the United States. Badlands National Park: Created by the forces of water, carving amazing pinnacles and gullies, The Badlands and it's cliffs have been transformed for the past half million years. Wind Cave National Park: This park features one of the world's longest and most complex caves with an outstanding display of boxwork, an unusual cave formation composed of thin calcite fins resembling honeycombs. Great Smoky Mountains National Park: The nation's busiest park covers 800 square miles of mountainous land and preserves some of the world's most stunning deciduous forests. Big Bend National Park: From terrain covered in yuccas, bunchgrasses, and cactuses to the Rio Grande and its steep canyons, Big Bend National Park is spectacular and wild. Guadalupe Mountains National Park:​ Features portions of the world's most extensive and significant Permian limestone fossil reef; includes Guadalupe Peak, the highest point in Texas at 8,749 feet. Arches National Park Arches contains some of the country's most amazing natural wonders, with mammoth rocks and arches formed from erosion. Bryce Canyon National Park: No other national park showcases what natural erosion can build than Bryce Canyon National Park. 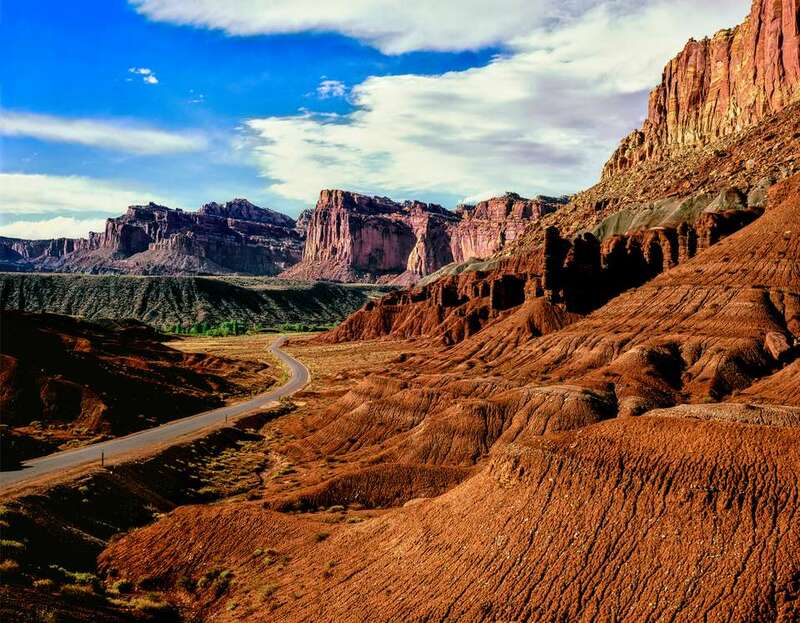 Canyonlands National Park: In this geological wonderland, rocks, spires, and mesas dominate the heart of the Colorado Plateau cut by canyons of the Green and Colorado rivers. Capitol Reef National Park: Capitol Reef National Park protects the Waterpocket Fold, a 100-mile long warp in the Earth's crust, as well as the unique historical and cultural history of the area. Zion National Park: Located in Utah's high plateau country, the Virgin River has carved a gorge so deep that sunlight rarely reaches the bottom! Shenandoah National Park: This quiet and tranquil national park is only 75 miles outside of the nation's capital and equipped with massive mountains, majestic woods, and stunning vistas. This is a great spot to take in fall foliage. Mount Rainier National Park: This greatest single-peak glacial system in the United States radiates from the summit and slopes of Mount Rainier, an ancient volcano. Olympic National Park: Olympic National Park encompasses three distinctly different ecosystems—rugged glacier-capped mountains, stands of old-growth and temperate rain forest, and more than 60 miles of wild Pacific coastline. Grand Teton National Park:​ With the magnificent Teton Range as a backdrop, this park is one of the most uniquely beautiful spots in the United States. Yellowstone National Park:​ Mixing geothermal activity with the natural world of the Wild West, Wyoming's Yellowstone National Park exemplifies iconic Americana.